There’s no questioning it, me and Deb love Monster Hunter franchise. She’s been playing since Freedom on PSP and I started on Monster Hunter 3 since I have never owned PSP. So it meant a lot to go to E3 and try out Monster Hunter Generations on Nintendo 3DS. I wish we could’ve recorded our gameplay, but since both I and Deb participated, no one was there to record us play. Please bear with me as I explain what to look out for when MHG’s demo comes out soon. The first thing the demo does is to give you choices of hunt based on difficulty. I chose Nargacuga, which was intermediate difficulty. In hindsight, I should’ve chosen Malfestio (easy) for the reason I will get to later. Next, you get to choose your hunter based on weapon. Deb chose Switch Axe, while I chose Light Bowgun. 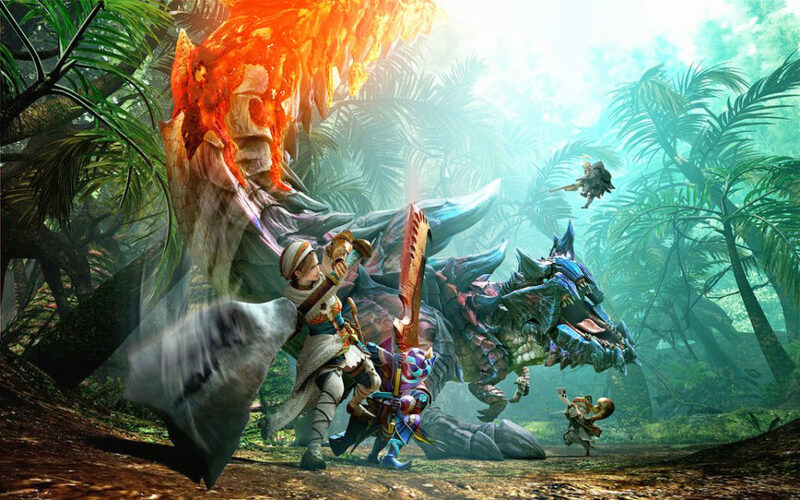 The new feature to MHG is the ability to choose one of the four unique hunting styles. You can choose Aerial to jump instantly, or choose Adept to have the insta-abilities, such as Instant Dodge. There were two other guys joining us in this hunt, and I could tell from overhearing that they were not familiar with this game. At that moment, I knew we might be screwed since Nargacuga is not for novice to jump in. Since this is demo, both HP and Stamina are at max capacity from the beginning. All four of us start at the camp, and we make our way to Nargacuga, which is conveniently marked in the map (for people just getting into Monster Hunter, the monster will not be marked at the beginning like in demo version). We find Nargacuga, and we start the attack. If you have never faced Nargacuga before, think feline counterpart of Tigrex, a lot of jump attacks and multiple swipe attacks. Because of its wild patterns, it requires understanding of similar type of monsters previously. To activate the hunting style abilities, tap the ability you want to activate on the touch screen. The meter on the ability bar fills up over the duration of hunting and the button will light up when ready to be activated. For my Light Bowgun abilities, it took some time to get used to. The geyser trap ability took some time to get used to because of activation delay (especially not effective for fast monster like Nargacuga). Barrage fire was great, but I was sitting duck and Nargacuga knocked me around a few times. The Instant Dodge was a freaking life-saver and you’ll use that more often than the other two abilities. In the end, we failed the hunt because the time ran out. We did manage to limp it, but by then only about one minute was remaining. Despite the loss, it was a wonderful experience and we are more hyped than ever about Monster Hunter Generations. Demo is coming out soon, so be sure to check it out first.